A couple of weeks ago, as I followed our tour group, I saw this sign over a storefront on a busy street in Galway. 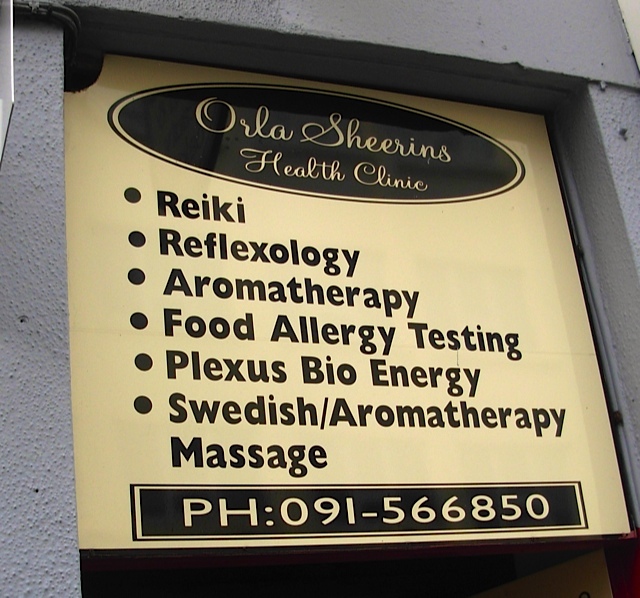 How surprising to see that Reiki was practiced in Ireland. Check out her latest newsletter. Greetings to all! It is always time to “get busy” again when autumn arrives. The Reiki Share Project is developing new programs, seeking new venues and spreading the good news about Reiki. Our work continues! Linda first learned about Reiki from a co-worker who is a Reiki Master. “Eight years ago, very few people had heard of Reiki. I needed an understanding of what Reiki is and how it could be presented credibly in a health care setting.” Linda was introduced to Reiki Master Teacher Janice Spoelma who agreed to provide her expertise in setting up and supervising the new Reiki Clinic at the Cancer Center. Janice carefully recruited Reiki Master volunteers for this program. “It takes a special person to work with people who have a serious illness such as cancer.” Janice now has approximately 20 Reiki volunteers who offer their services. Please consider making an “end-of-year” tax-deductible donation toThe Reiki Share Project. We are a 501(c)(3) nonprofit organization in the state of Illinois. Your donation will support our work in making Reiki classes available at little or no cost to people and families who are dealing with serious illness and disability. Your donation will be gratefully accepted! Thank you! Quality improvement data was recently gathered by Wellness House, a nonprofit organization that provides programs for those with cancer. Participants were asked to rate their stress, pain, & anxiety on a 0-10 scale before and after their Reiki sessions. The survey results are illustrated in the above chart. It appears that Reiki helped to lower the reported levels of stress, pain, and anxiety for this particular group. Kids can learn Reiki too! The Reiki Share Project is in the process of developing Reiki programs for both children and teenagers in cooperation with Wellness House which provides programs for those dealing with cancer. The first program, “Reiki for Families”, will be offered in February, 2013 and will bring children (ages 7-11) and their parents together for a day of learning how to connect with Reiki and share it with each other. This class is for families who have a loved one diagnosed with cancer and who are seeking ways to bring peace and healing into their homes. The second program is for teens whose lives have been touched by cancer.We are interested in hearing from our Reiki readers—do you have experience in teaching Reiki to children or teens? TRSP will keep readers updated on these two new programs! Thank you for reading our newsletter! If you have any questions or comments about our work, we would love to hear from you. Send us an email. Wishing you many blessings during this season of gratitude! Fascinating. I tend to think that these forms all come out of California–and exist only in America.